First Aid Training Cooperative provides and delivers a range of first aid training courses across Scotland and throughout the UK, from regulated and approved Emergency First Aid, First Aid at Work and Outdoor First Aid training, to a spectrum of sector-specific and advanced first aid courses. 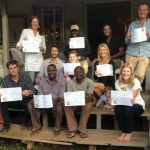 Our highly experienced, approachable and professional first aid trainers ensure that our courses are memorable and easily applicable. Every course participant receives a free copy of our digital first aid manual to ensure their training stays with them at all times. With outstanding client feedback and years of experience, we make First Aid Training convenient, relevant and, most importantly, life-saving. We provide a broad range of high quality training courses covering both general and specialist topic areas, and at all levels from introductory to advanced first aid training. Our courses also cater for a number of specialist industries and sectors, including paediatric first aid, outdoor first aid, first aid for sports coaches and exercise professionals, first aid for forestry, first aid for forest schools and outdoor woodland learning. 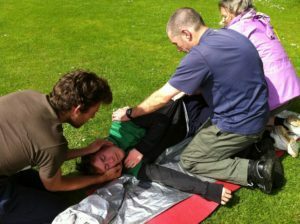 Our public first aid courses, bookable online, take place in a range of locations across Scotland and Northern England, including Edinburgh, Glasgow, Aberdeenshire, Inverness, the Lake District, Manchester and Newcastle. These courses are suitable for employers, community leaders and individuals looking to not only fulfil legal and regulatory requirements, but also to receive life-saving training and increase their personal knowledge. Our private first aid courses, more suitable for groups, can be specifically tailored to your needs and can take place in your workplace or community venue. Our expertise in a number of sector specialisms means that we’re able to provide you with the most relevant training for you and your employees. With many course and payment options available, a bespoke on-site first aid course can be arranged by contacting us directly. If you'd like to discuss your requirements or if you need any help finding the best first aid course for you, simply complete the form below or call our office for free on 0333 4330 731.